A potpourri of stewed dark fruits, plums in armagnac and Christmas pudding. Sweet with Demerara sugar and sherry, followed by a delicate spiciness of oak, cinnamon and tobacco leaves. Fruity and sweet with a load of stewed fruits and sherry, followed by brown sugar and dark chocolate. Very warming mix of spices - oak in particular, tobacco leaves and cinnamon. Slightly bitter notes of walnuts and espresso linger towards the finish. Extremely mouthfilling. The finish is long lasting, sweet and creamy with sticky fruit jam, coffee aroma and a delicate nuttiness. Becomes spicier when a splash of water is added. Still sweet and fruity with more tobacco notes in the back. Sweet and fruity on the palate with an increased spiciness (oak, black pepper and nutmeg) and far more nutty flavours. The finish is still long, sweet and creamy with dry notes of oak, walnut and tobacco on the tail. What the colour suggests nose and palate fully deliver. 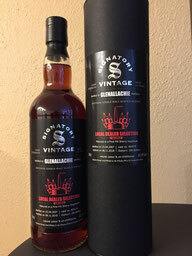 This GlenAllachie is incredibly rich and complex for its only 11 years. A potpourri of dark ripe fruits, chocolate, tobacco notes and loads of spices. The alcohol is very well integrated - perceptible, but not pungent at all. The ideal companion at the end of a successful day in front of the open fire. Certainly a must have for the sherry aficionado.